Sometimes it’s hard to believe the “dumb jock” stereotype persists when you have counterexamples as big and as brainy as Kareem Abdul-Jabbar. The 67-year-old New Yorker is a giant in the sports world, and not just because he stands 7-foot-2. 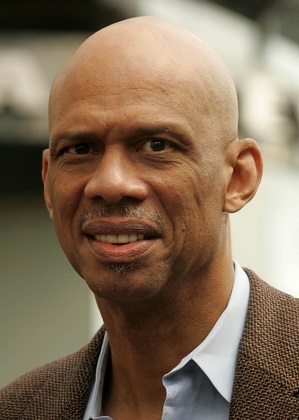 Abdul-Jabbar is the NBA’s all-time leading scorer, a six-time NBA champion and six-time league MVP, a three-time college national champion and national player of the year at UCLA, and a member of the Naismith Memorial Basketball Hall of Fame. On the court, Abdul-Jabbar was a cerebral player whose intelligence helped him dominate as much as his athleticism. Off the court, he has been appointed a national education ambassador by the Obama Administration, he has authored at least eight books (with more on the way), and he has written and produced a documentary based on one of his books. One of the major debates this year has been whether or not racism exists anymore in America. Not surprisingly, polls indicate that most African Americans say yes it does exist while most white Americans say that it doesn’t. Blacks point to disproportionate prosecution and persecution of blacks by authorities, and whites point to President Obama and dozens of laws protecting and promoting minorities. They are both right. There are plenty of laws and government agencies dedicated to eradicating racism. America has made it a priority. Affirmative-action programs have created more opportunities for minorities, sometimes at the expense of whites seeking those same opportunities. That should be acknowledged and appreciated. But suppressing racism is like pressing on a balloon: you flatten one end and it bulges somewhere else. Racism has gone covert. For example, the Republican effort to pass laws demanding IDs to combat voter fraud is itself fraudulent and racist. It is a form of poll tax, which was outlawed in the 24th Amendment to the U.S. Constitution. The poll tax was designed to keep blacks from voting, as is the voter ID. It costs money and time away from work, which is too great a burden for the poor, many of whom are minorities. The justification given is to stop voter fraud. However, a recent study concluded that out of 1 billion votes cast, there have been only 31 incidents of voter fraud. The reason whites don’t agree that racism is rampant is because most of them aren’t personally racist, and they resent the blanket accusation. In fact, they see themselves as victims of reverse racism. They, too, are right. Dr. King would have acknowledged their pain and fought to alleviate it by reminding us not to confuse institutional racism with the good hearts of our neighbors. The civil rights movement would not have achieved as much as it has without the support and sacrifice of white America. He would have also been disturbed by the violence and rioting that has occurred during these protests. We must remember that Dr. King’s cause was not just equality for all people, but achieving that equality through nonviolence. The ends do not justify the means; the means and the ends are the same. Violence insults his legacy. To him, anything won through force is not won at all — it is loss. He wanted equality achieved through love because he wanted to win over his enemies, not defeat them. As he said: “Love is the only force capable of transforming an enemy into a friend.” His goal was to cleanse the community, not to cleave it. I have mixed feelings about MLK Day as well. While I agree with many of Abdul-Jabbar’s points, I’m also wary about why Dr. King is held in such high regard compared to other Black leaders of his era. To be clear, I have as much respect for Dr. King as I do for anyone who has dedicated their life to fighting for equal rights. But why exactly is he the only one with a holiday? Why is he most often given the starring role in Black History Month school curriculums, while many of his counterparts remain ignored and glossed over by mainstream American history? I’ve long suspected that it’s because Dr. King’s message of nonviolence and turning the other cheek to hatred and bigotry is much easier to digest — simply more safe and comfortable, less threatening and dangerous — for White America and the descendants of those who made Black Americans’ lives miserable before and during the Civil Rights Movement. In the forever-tense state of America post-slavery, it seems White people have by and large preferred its Black heroes to be calm and patient rather than fired-up and assertive. Whenever we hear stories about people like Jackie Robinson and Rosa Parks enduring horrible treatment from racist Whites, they are showered with praise for how classy and dignified and amazing they were for taking the injustices and insults quietly without physically fighting back or even raising their voices. On the other hand, you don’t see the Black Panthers and Nat Turner remembered so fondly and with as much admiration. But didn’t the latter embody more of what we consider to be American values (think American Revolution) than the former? It is as if White America long ago developed a habit of neglecting to praise the Black people who literally fight back, for fear of inciting more Blacks to fight back. Especially when it’s obvious Black America has had good reasons to fight that go back several generations. Growing up, the embodiment of this form of promoting passivity was the noticeable difference in the way history treated Martin Luther King Jr. and Malcolm X (a.k.a. El-Hajj Malik El-Shabazz). As a minister for the Nation of Islam (before embracing the true practice of Islam shortly before his death by assassination), Malcolm X made people uncomfortable and put them on the defensive by telling them things they didn’t want to hear about themselves. If you pay close attention to the speeches and writings of Dr. King, you can see that he was just as passionate about equality and was just as committed to the cause as Malcolm X; he just knew how to speak in a way that would reach a bigger audience and not scare them away. Malcolm X’s brand of community leadership, defined by his famous “by any means necessary” quote, was outwardly heated and bluntly unapologetic. From the time I learned about both Martin and Malcolm as a kid I compared the two, and I was always drawn more to Malcolm’s style and his story. He is one of the people who would ultimately influence me to become a Muslim. And so I noticed that Dr. King had a holiday while Malcolm X did not. I noticed that while I learned about Dr. King in school every February, I had to learn about Malcolm X at home from my parents. 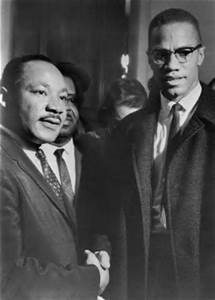 I noticed that Dr. King had the mainstream co-sign as an acceptable role model for a young Black man, while Malcolm X did not. I noticed that Dr. King was cast as the good guy and Malcolm X was cast as the bad guy. And it made me wonder — it still makes me wonder — if America is really interested in working toward a society in which racism is no longer a hindrance to the success and quality of life of so many of its citizens. Or, as Abdul-Jabbar writes, is this country simply interested in patting itself on the back for “winning” a war that is still being waged on its soil?